JUNEAU, Alaska (AP) — It’s a romantic idea — sailing across the ocean, sleeping under the stars. 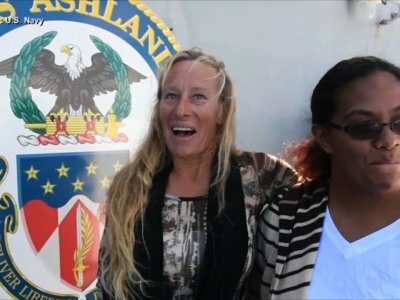 But earlier this week, the U.S. Navy rescued two women adrift in the Pacific Ocean about 900 miles off Japan, at sea for months after their sailboat became disabled. While some people wing it, experts recommend thoroughly understanding what you’re getting into and being as prepared as possible — taking lessons, having emergency and navigational gear, and packing more than enough food. John Neal, who with his wife, Amanda, conducts sail-training trips and seminars through their company, Washington state-based Mahina Expeditions, said crossing oceans is easier than it’s ever been. He cites modern instrumentation and sail-handling systems as examples. The women had left Hawaii in May in hopes of reaching Tahiti and exploring islands in the south Pacific. Details of their ordeal were still unfolding. The boat’s captain, Jennifer Appel, said she has traveled the Hawaiian islands and planned the Tahiti voyage for more than two years. But she said she and Tasha Fuiava may not have been as ready as they could have been. For newcomers, Neal recommends sailing lessons and navigation courses. He also suggests they gradually get comfortable in different wind conditions, going out, say, at 15 knots, then 20 knots, then 25 knots and learning what sail combinations work in increasingly strong winds. “That way, when you get halfway across the ocean and you get into a tropical squall where the winds could go up to 50 or 60 knots, you don’t freak out,” he said. As for the boat, experienced sailors would have professionals inspect it — its sails, its engine — before leaving, said Mike Michelwait, owner of the Honolulu Sailing Company, a sailing school and charter company. If you’re unfamiliar with engines, have a mechanic check it out and recommend spare parts you should carry — “and have plenty of them on board. If the maintenance is done properly you shouldn’t have a problem,” he said. The U.S. Coast Guard requires certain gear, like life jackets, a horn, a bell and flares, Neal said. He additionally has GPS units, satellite phones and emergency radio beacons, which he said cost $250 and allow for the nearest marine rescue coordinating center to know your exact position to within 30 meters of the boat, no matter where you are. Such gear has become standard, but whether someone has something can depend on experience, finances or personal preferences, said Phil Moritz, a semi-retired dentist from Alaska who has been sailing much of his life. Neal said a satellite phone can cost $1,200, and it would be strange not to have long-range communications. But he said not everyone can afford one. Appel said they had a VHF radio, a ham radio, a weather satellite and a radio telephone, all of which didn’t work because they had a communications failure with their antenna. A satellite phone they carried also never seemed to connect. Appel and Fuiava sent out daily distress signals and said they fired signal flares and unsuccessfully tried hailing different ships. They lost one of their cell phones early on but were out of cell range anyway. People generally would plan to have food for twice the amount of time they expect to be out, Neal said. Dry foods, like pasta and oatmeal, don’t take up a lot of space and don’t weigh much. Moritz said food was never his biggest worry. Appel said they had a working water maker and they still had food when they were rescued. Michelwait, who has sailed the route from Hawaii to Tahiti several times, said he wouldn’t take a trip like that with any less than three experienced sailors. The women were on a 50-foot boat. “That’s a lot of boat to handle,” he said. Neal and his wife, on their website, also say being in good physical shape is important. “Ocean voyaging is more physically demanding than most people expect, even on a large, modern and comfortable boat,” their site says. Associated Press reporter Caleb Jones contributed from Honolulu. Bohrer can be reached at https://twitter.com/beckybohrerap.